The Great American Thirst resists being bound. It is the Incredible Hulk erupting, wearing nothing but tattered jean shorts; tearing chunks off skyscrapers. Colonial America in the 17th and 18th centuries swam in drink. Even the clergy wasn’t so prudish as to leave barrels of brandy and whiskey empty to all comers. In fact, it was practically an insult not to have spirits on hand. Distillers, mainly from Maryland, Pennsylvania, Virginia, and North Carolina, hitched up their carts and forged beyond the Appalachians. They grumbled over the Wilderness Road behind horses braced in bridles and harnesses. In 1787 Judge Harry Inness noted that “10,000 Souls had been counted to cross Clinch.” In tow was their spirited equipment. No one, for sure, can name Kentucky’s first distiller. Was it Evan Williams or Elijah Craig? The time across which the first distiller arrived is believed to be sometime between 1775 to 1789, but even that is open to debate. The distillers continued to pour in, some across land, some by a conveyor belt of water, the Monongahela River, which funneled flat boats with as many as five families aboard to the Ohio River and then the Falls of the Ohio. The Falls of the Ohio, stern rapids, proved difficult to navigate and gave rise to what we know today as Louisville. The 18th-century frontiersman — still largely British transplants — moved west on horseback towing distilling equipment. Circa 1790, Kentucky’s vast land was populated by only 73,677 people. This prompted Daniel Boone to say that he felt Kentucky was too crowded when a neighbor moved within 10 miles of him. With so much distance between each other, there needed to be gatherings so Kentuckians hosted fairs. Men took their horses, their whiskey, drank and raced. 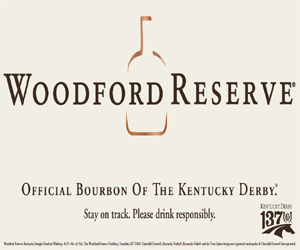 According to Woodford Reserve Master Distiller Chris Morris, President Andrew Jackson even said Kentuckians are “meaner than alligators,” to describe their competitiveness. Morris said there was once a distillery — New Hope Distillery — and around it was a track with horses running circles and loops in the orbit of Kentucky’s caramel-colored blood. After the South seceded, after Americans spilt kegs of their own blood, when the slaves walked, and during Reconstruction, the distilling business and the horse racing business took different turns but remained tethered. “Horse breeders would invest in distilleries and vice versa,” Morris said. James E. Pepper, whose family founded the distillery that would eventually become Woodford Reserve, owned several racehorses that he named after his sisters. Pepper never won the Kentucky Derby, but he did win the Kentucky Oaks in 1892 with Miss Dixie. The French littered Kentucky with names. Paris: Versailles. Louisville. Bourbon. A Bourbon County newspaper, in 1821, touted “BOURBON WHISKEY” by the keg. Veach speculates that when Napoleon Bonaparte had to fund his war with Britain, and sold Louisiana to President Thomas Jefferson, that the ports of New Orleans erupted with potential. “The best guess I have is that Kentuckians, after the Louisiana Purchase, when New Orleans was more usable, undoubtedly opened up and everyone sent their whiskey there,” Veach said. Yet, whiskey already was being produced in the Big Easy, at the same cost as Kentucky whiskey. Shipping a similar product to New Orleans made as much sense as selling dirt to an earthworm. Hence Kentucky distillers began aging their whiskey in charred barrels to better imitate the brandy les gens imbibed. “Evidently it worked,” Veach said. The name bourbon stuck and remained within the borders of the county until the recipe was worth repeating. Bourbon finally identified itself as a “delightful whiskey” by the year 1840. So, what is whiskey? There was the rectifying industry, which took bulk whiskey and blended it with other alcohol and flavorings and touted its “bourbon products,” a dash of this and a dash of that. Buy from the wrong distiller and the burn from your bourbon could be from a few moles of sulfuric acid. So, in 1906, the Pure Food and Drug Act went into law. So, again, what is whiskey? Straight whiskey had to be labeled as such (at least 51 percent corn, made in the United States, aged in new charred oak barrels, etc.). Naturally, this enraged a great number of the hybridizers. 1n 1909, President William Taft’s legal mind weighed the defenses of what whiskey should be. The ensuing Taft Decision set in stone the separation and purity of straight whisky and the “lesser” blends, and these bourbon standards survive today in the making of every bottle. “It was the right decision because nobody liked it,” Veach said. If the needle is bourbon, then the thread of Kentucky’s fabric must be horse racing. If you book a U.S. Airways flight and surf on the jet stream in the north Atlantic and touch down in Europe and say you’re from the beautiful and honorable state of Kentucky, you’ll likely be known for three things, “Bourbon whiskey, Colonel Sanders and the Kentucky Derby,” Veach said. Seventy-four years ago the Kentucky Derby adopted the mint julep as its official drink. Many people who settle on the infield for Oaks and Derby Day find a vendor and drop down money for simple syrup, crushed ice, bourbon whiskey, and a spear of mint–roughly 120,000 will be sold during the weekend. Just like the early days of the New Hope Distillery, there rests the bourbon-swollen middle with horses running round and round, now as it was back then.